Sequential One is a masterpiece where each function is based on a combination of elements rotating on 3-dimensional axes, at different speeds and moments. The Minutes display dial in brushed sapphire is opaque enough for one to see the hour prisms gently. The watch case marries generosity and refinement in a subtle and elegant way. The square case shape is gently sweetened by rounded edges, leaning towards the creation of a sphere. The strong and powerful character of the watch is preserved, and the watch gently nestles on the wrist. Sequential One has another intriguing feature, where light is channelled into the movement through a layer of sapphire crystal, ingeniously sandwiched between the two elements of the elegant watch case. Sequential One is a totally integrated design and all parts of the watch are made in Switzerland and are unique to MCT. Only the highest specification materials are selected for each timepiece. This watch is totally unique, technically complex but simply elegant. Sequential One is a stunning watch thanks to its unique display system: oversized, sequential hours, 20 visible prisms and a rotating, “jumping dial”, delicately crafted from sapphire crystal. Massively complex to design and produce this system offers simple and easy readability. This stunning timepiece is a first in watchmaking history. The hour is presented on a series of 5 triangular prisms in four different positions. Minutes are indicated by the 18 carat Minute hand which has either a white or red flash, depending on the choice of gold watch case. When the minute hand reaches 60, the delicate sapphire crystal Minute dial springs anti-clockwise 90°, to reveal the next hour. Without moving, the Minute hand is now automatically reset at 0 minutes, ready to begin another 60 minute cycle. The prism rotation is a masterpiece of elegance and fun. When the Minute hand approaches 30 on the sapphire dial, the prisms directly opposite the indicated hour start to slowly rotate clockwise, taking a few minutes to display a new hour numeral. Compromise is never considered at MCT. In designing this timepiece, the team placed great emphasis on longevity, so that each watch will last a lifetime. The in-house watch assembly and in-house quality control techniques employed by Master Watchmaker, Jerome Marcu, are second to none. After-Sales, including servicing will be conducted in-house, by Jerome and his team of highly trained watchmakers at MCT. Sequential One is manufactured from many luxurious materials and has 81 rubies. Each timepiece features an exclusive MCT hand-wound mechanical movement, designed to operate perfectly, 24 hours a day. The delicate sapphire crystal Minutes dial has two functions, firstly to clearly display the relevant hour and secondly, to obscure following hours until it is time for them to be individually revealed. The Minute Hand is made from 18 Carat Gold and has either a red or white flash to enable the wearer to see the minute indication very easily. The Sequential One hand-wound mechanical movement was developed by MCT, only for use in MCT luxury timepieces. There are 471 pieces in this ingenious mechanical movement. 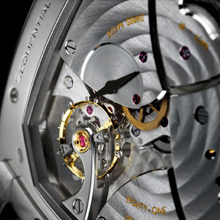 This movement is considered more technical and difficult to produce than a tourbillion. The energy requirement to drive the movement, spin the sapphire Minutes disk and turn the prisms presented Denis and the team with a horological challenge. They mastered the challenge by producing this complex but highly reliable movement which is powered by hand-winding. A sophisticated anchor clutch is included, which prevents over-winding. The special system that accumulates and stores power for the rotation of the disk is subject to a patent. Energy is constantly being drawn from the movement and it takes one hour of stored energy to power a single 90° rotation of the Minutes disk. 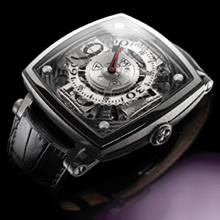 When fully wound, Sequential One has a power reserve of 40 Hours. Sequential One features the enchanting and extraordinary Straumann Double Hairspring which controls the rythym and equilibrium of the movement. This innovative escapement has two balance springs oscillating against each other. The springs are manufactured as a matched pair under optimal conditions. This process ensures the total elimination of gravitational error. At the middle, it’s deepest point, Sequential One is 15mm thick, reducing to only 6mm at each edge. The stunning watch case is made up of 41 different elements. The case has been designed in such a way that the watch can be easily disassembled for servicing and strap changing without disrupting the movement. Between the two main elements of the case is another ingenious feature ; a slice of sapphire crystal. This crystal has two functions. First, to enhance the aesthetics of this beautiful timepiece and second to allow light to flood into the mechanism, allowing the wearer to see the beautiful movement more easily. The lug collars which anchor the strap are also a unique feature of Sequential One. These collars (MCT patent pending) were carefully designed to allow the timepiece to rest easily on the wrist and to add a touch of elegance and uniqueness. The elegant black watch strap is handcrafted from Alligator leather. The inside of the strap is anti-allergic. The double deployable clasp is manufactured from 18 Carat gold with an elegant MCT fastening. Rotating minutes dial crafted from delicate sapphire, strap alligator, double hand stiched with anti-allergic inner leather. 18 Carat Gold, double deployment clasp. Standard strap dimension 120mm x 70mm.